The new K9-3 has superceded the world leading Dingo 950. The 950 revolutionised the Mini Digger industry with more power and versatility than ever seen before. It quickly became Australia's favourite mini digger and the first machine of its type to enter many overseas markets. 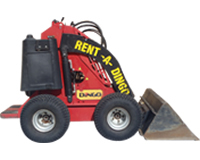 Those tried, tested and impressive specifications of the Dingo 950 remain the same for the Dingo K9-3, but with some new improvements.